SOCAR President Rovnag Abdullayev met with President of the Russian Lukoil Company Vagit Alekperov on March 18, who is on a visit to Baku. During the meeting, the sides discussed long-term relations between Lukoil and SOCAR. Lukoil's participation in projects implemented in Azerbaijan was highly appreciated. 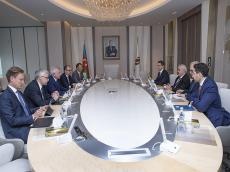 Alekperov underlined the strategic importance of his company's relations with SOCAR and highly appreciated the creation of favorable conditions for foreign investments by the Azerbaijani government. In this regard, he expressed his pleasure in investing in new fields in Azerbaijan and expressed his satisfaction with cooperation in various fields. Oil company "Lukoil" is one of the leaders of the oil business in Russia. Lukoil is one of the largest international vertically integrated oil and gas companies, providing 2.2 percent of world oil production. Lukoil has been operating in Azerbaijan's oil and gas sector since 1994, when the company entered its first international project on the development of the Azeri-Chirag-Gunashli oil field, one of the largest fields in the Caspian Sea. The company has 10 percent stake in the projects "Shah-Deniz" and "South Caucasus Pipeline". Lukoil is also interested in participating in such projects as “Umid-Babek” and “Absheron” in Azerbaijan. In addition, the company is involved in the retail fuel market. Since 1995, Lukoil has also been developing its own distribution network of filling stations in Azerbaijan, which meet international standards. The company manages 58 petrol stations and an oil depot, which ensures transfer of 320,000 tons of oil per year. Due to this, Lukoil has become a reliable supplier of diesel fuel and motor gasoline, as well as lubricants to large international and Azerbaijani companies operating in the local market. So far, Lukoil implemented landmark projects in the fields of hydrocarbon production, retail and wholesale of petroleum products, telecommunications, insurance, banking, multimedia businesses in Azerbaijan. The contribution of Lukoil to the charitable support of culture, science and education of Azerbaijan, religious denominations of the republic, veterans of war and labor is significant.